Only the lower leaf remains of this ivory diptych dial. The outer part has a lunar volvelle with geometrical decoration and two bun feet. 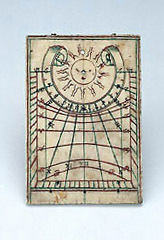 The string gnomon dial is marked for common hours with green lines, and there is a pin gnomon dial for the declination of the sun, indicated in red lines.